The NITRO RC Helicopter is the original RC helicopter. Not to be confused with the GAS RC Helicopter. The differences are explained. The first modern RC helicopter was a NITRO RC helicopter. 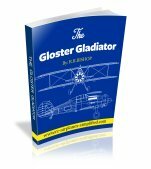 This is not to be confused with the GAS RC helicopter. Many people use the term GAS to describe a NITRO heli. Sorry to confuse you! The GAS RC helicopter is powered by a GASoline fueled engine and the NITRO heli is powered by a GLOW ignited model airplane engine, that uses a mixture of methanol, oil and NITROmethane. Gas RC Helicopters are explained in more detail, on this page. As I was saying, this part of the RC hobby started about 25 to 30 years ago and the first really successful remote controlled helicopter was a NITRO powered machine. The 2-stroke glow engine ( or NITRO engine!) is used because this type of engine has the highest power to weight ratio available to modelers. It is also a very reliable power plant. 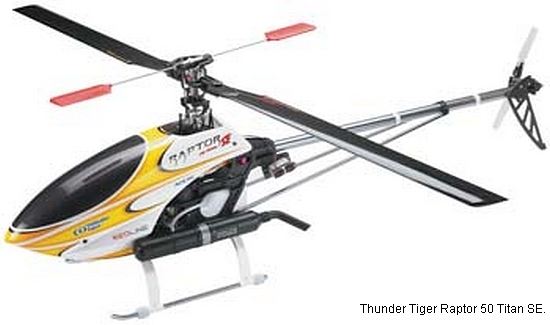 Until quite recently, this type of RC helicopter was the most popular. Today the electric revolution has made RC electric helicopters top of the heap. The advantage the nitro helicopter offers is as long as you have fuel, you can fly. No waiting for lithium polymer batteries to charge, just fuel up and fly! A lot of people also like the idea of a real engine powering their heli and like the sound and smell of the glow engine. One characteristic that all helicopter engines must have is total reliability! Unlike a fixed wing machine, helicopters do not glide! With a fixed wing RC airplane, if the engine quits, it is possible to execute a safe landing, hopefully on the runway. The RC helicopter has no such possibility. Auto-rotation is possible, but does require skill and altitude to execute successfully! 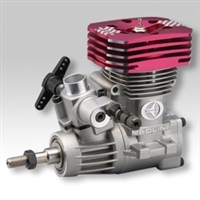 The 2-stroke nitro engine can give total reliability and long life. In a nitro RC helicopter installation, the engine is generally run richer than when being used in an RC airplane. This can be seen in the blue/white smoke billowing from the helicopter muffler. The rich setting is preferred for the extra reliability it gives and helis are usually running at about 3/4 throttle setting and rarely use full throttle. 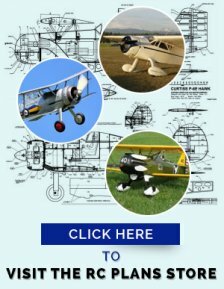 Visit the page devoted to RC model airplane engines for further information. To ensure that absolute reliability we should start with the model airplane fuel used. Use fuel recommended by the engine manufacturer. This usually contains more nitromethane (Nitro) than regular model airplane fuel and maybe a little more oil, This page gives more information on model airplane fuel. I assume the fuel from the factory is clean. I do install fuel filters from the fuel bottle to the airframe and also from the internal tank to the engine. We must ensure we have clean fuel feeding the engine. There is a lot to be said for keeping the support equipment as simple as possible. A mess of wires and cables around a nitro RC helicopter is not a good thing! So let us use a system that has zero cables. The first item we require is a fuel pump. The simplest pump I know is a manual pump. The photo at left shows the Dubro Fillin Station . 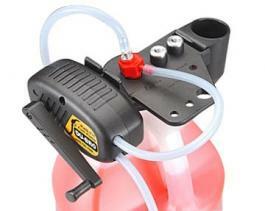 This attaches direct to the top of the fuel bottle, in fact it is a replacement cap! This version comes without the glow igniter, but the pocket to store it can be seen at the rear of the top plate. The hand cranked pump is there, as well as places to store spare glow plugs and a plug wrench. What else is required, on the flight line? The photo at left shows a typical glow igniter. Many styles and types are available and the simplicity of this design really appeals to me! It can be stored in the caddy as shown in the above photo. 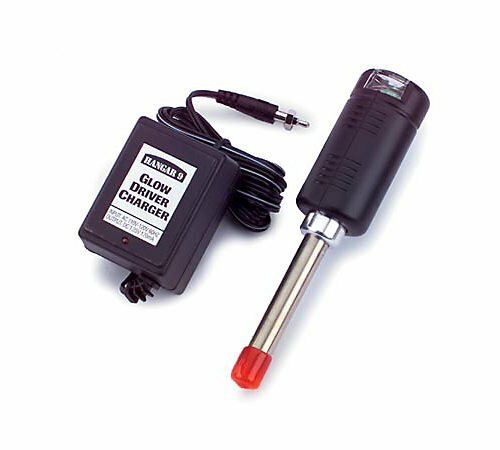 The body of the igniter contains the battery-either a NiCd or NiMh type. The charger stays at home and a charge will last for many flying sessions! 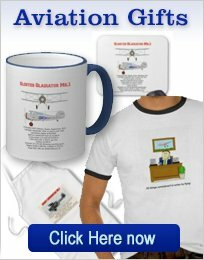 The final item you need is a starter system for your nitro RC Helicopter. The one shown in the photo is a combination of 3 suppliers. Adapters are also available for other starters. The extension contains a one way clutch and a thrust bearing. The video below shows how simple it can be to start the typical nitro helicopter.